The report analyzes the number, size and recipients of gifts of $1 million or more given by individuals, foundations and corporations in the United States, United Kingdom, Russia, Middle East (Gulf Cooperation Council), China, Hong Kong, Singapore and for the first time, South Africa. It also includes a discussion section on India, and case studies and profiles of donors in each of the regions. "Philanthropy is a global enterprise. Understanding how various aspects of philanthropy, such as giving at the $1 million-plus level, are similar and different across geography and cultures is now more important than ever," said Amir Pasic, the Eugene R. Tempel Dean of the school. "We are pleased to once again collaborate with colleagues around the world on this valuable report, and to share insights about giving at this level." Almost a third of the total value—$7.58 billion—was given to universities and other higher education institutions, which frequently receive gifts at this level, in part because of their ability to absorb large donations. The donations are often intended to support academic and scientific research, scholarships, new facilities and university endowments. While the $24.5 billion represents a $1.8 billion decrease and the number of donations declined by 164 from the 1,995 donations worth $26.3 billion reported for 2013, the underlying data show that this can be correlated to declines in the U.S., Russia, Singapore and the Middle East. By contrast, in regions such as the U.K., China and Hong Kong the relative level of donations increased substantially. The report should not be used to compare or rank the dollar value of giving or number of gifts by region, as comparisons would be misleading because the nature, structure and stage of philanthropy varies greatly from region to region, and because data on giving are more accessible in some regions than others. Higher education remains most popular recipient - Looking at the total across all report regions, higher education topped the list in terms of both the number of donations and the greatest value, receiving $7.58 billion from 798 donations. In terms of value received arts, culture and humanities jumped three places up the list and received over half a billion dollars more as a sector than in 2013. Individuals give more money in total than foundations and corporations - Individual donors gave 59 percent of the $24.5 billion donated across all regions. Foundations accounted for 25 percent of the total value of donations and corporations gave 16 percent. Foundations as recipients - Foundations were the second most popular destination for $ 1 million-plus donations, receiving $6.77 billion from 168 gifts. Local Giving - A majority of $1 million-and-up gifts are given to recipients in the regions where the gifts originated. With the exception of the Middle East, where as in previous years the vast majority of donations were directed overseas (outside the GCC), more than 95 percent of the total number, and nearly 90 percent of the total value of donations were given to charities within the donor’s own country or region in 2014. Donors concentrated around major cities – The results for 2014 revealed a concentration of major donors around large cities and economic hubs. The U.S. is a notable exception, with $1 million donors relatively evenly spread across the country. London remained the center of U.K. giving, with 67 percent of the value of $1 million donations originating there. In China, 74 percent of the value of donations originated in the eastern region around the municipality of Shanghai. In contrast to 2013, Russia’s major donors were increasingly concentrated in and around Moscow. Similarly, South Africa’s donors were principally based in Johannesburg or Cape Town. Lenka Setkova, executive director of Coutts Institute, said, "Major philanthropy plays an important role in strengthening societal, cultural and economic development around the world. The 2015 Coutts Million Dollar Donors Report tracked 1,831 donations worth an impressive $24.5 billion across eight regions last year. Whilst these numbers are lower than the previous year, it is evident that major philanthropy remains strong and in certain regions, including the U.K., China and Hong Kong, it has grown substantially. This report provides insight into trends in million-dollar giving and explores some of the factors that shape philanthropy in each of our featured regions." In the U.S., $1 million-plus gifts to charity from U.S. corporations, foundations and individuals totalled more than $14 billion in 2014. The overall value of $1 million-and-up donations was boosted by some very large contributions: gifts in excess of $10 million made up more than a fifth of the overall number of U.S. donations at this level. Both the overall number of U.S. $1 million dollar gifts and the cumulative dollar value of those gifts declined slightly in 2014. A total of 1,064 donations of $1 million-plus were made in the U.S. in 2014, a decrease of 9.3 percent from 2013. The value of the 2014 donations totaled $14.11 billion, down from $16.92 billion for the previous year. By contrast, the number of gifts from U.S. individuals of $1 million or more rose from 435 gifts in 2013 to 542 in 2014, and the dollar amount individual giving at the $1 million-and-up level remained about the same. Individual donors were the bedrock of U.S. $1 million dollar giving, providing more than half the donations and two-thirds of the overall value ($9.41 billion) in 2014. Corporate giving at the $1 million-and-up level remained near 2013 rates in both the number and value of gifts. Corporations and corporate foundations gave 134 $1 million-plus donations totaling $680 million, representing 5 percent of the total value of gifts in 2014. Most of the overall U.S. decrease appeared to come from foundations: researchers found that $1 million-plus giving by foundations was down by a third from 2013, tumbling from 575 gifts to 388 gifts and from $5.93 billion to $4.02 billion. Foundation giving also declined as a share of all U.S. $1 million-plus giving, dropping from 35.0 percent to 28.5 percent of the total value. "At this high level, different types of donors react differently to economic conditions. The rise in individual donors is encouraging since we know that individual donors tend to give more when the economy is improving," said Una Osili, director of research for the school. "While unfortunate for the nonprofit sector, the drop in foundation giving is not entirely surprising, since foundation giving is more counter-cyclical, rising to meet increased needs during times of economic difficulty, and falling more when needs are not as great." In 2014, 51 percent of all U.S. $1 million-and-up gifts came from individuals, while 36 percent were given by foundations and 13 percent were given by corporations. The largest number of donations (432, or 41 percent) were gifts of less than $2 million, with a similar amount in the $2 million to $10 million range (392, or 37 percent). The average (mean) donation declined slightly from $14.4 million in 2013 to $13.3 million in 2014, but the 2014 figure was still the third-largest average in the past decade and significantly higher than the 2012 mean of $9.9 million. Four-fifths of the 724 organizations receiving gifts of $1 million or more received only one such donation in 2014. A handful of organizations received more than one gift, with the biggest beneficiary, Michigan State University, receiving nine separate gifts. Higher education remains the destination of choice for the majority of U.S. $1 million donations, receiving more than half the number of donations (56 percent) and 42 percent of the overall value of $1 million-and-up gifts in 2014, continuing a recent trend. Foundations remained the second-highest recipient category in the U.S., receiving 20 percent of the total value given. Gifts to overseas organizations saw a significant fall from 2013, dropping from 13 percent of the total value to 2 percent, largely due to especially large gifts given to organizations in this category in the previous year. The report builds on the success of Coutts’ Million Pound Donors Report - published since 2008 - and the Indiana University Lilly Family School of Philanthropy’s Million Dollar List. A key feature of this year’s report is the views and opinions of major donors. The interviews illustrate the diverse motivations for philanthropy, the wide range of causes and communities that donors choose to focus on, and the different approaches people take to achieving their philanthropic goals. The result is a series of inspiring, frank and honest interviews. The report website brings the findings to life and includes in-depth analysis, along with full-length interviews with $1 million-plus donors and charities. 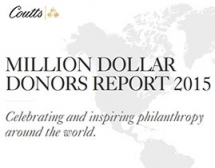 Coutts has produced the Million Pound Donors Report since 2008 to provide insight into major UK philanthropy. In 2013, we decided to cast our net wider to capture the scale and nature of donations of $1m or more in the USA, Russia, Middle East (GCC), China and Hong Kong. In 2014, we added Singapore to the mix. This year, South Africa features for the first time and we are also pleased to include case studies and a discussion section covering India. The result is a report that is a leading authority on major philanthropy internationally. Our report is about more than just data. The inspiring interviews with major donors demonstrate that philanthropy is driven by their values, passions, interests and visions for a better future. As always, we are very grateful to the donors who kindly shared their personal experiences of philanthropy with us. The social, economic and political contexts of the regions we looked at vary enormously. Data on million dollar giving may be easily accessible in countries like the UK and the USA, but in other regions it is not as readily available. Whether this is due to the relative infancy of the philanthropic sector, or because of cultural factors that encourage major donors to stay out of the public eye, the result is that the true scale of giving in some areas is likely to be considerably larger than we report. This is particularly true for Russia and South Africa, where lack of available public data means that local researchers gather information by means of a survey. We would also like to acknowledge that a vast number of donations occur below the $1m threshold, which are not tracked in this report. These considerations mean that it would be misleading to make direct comparisons between the jurisdictions covered. This report nonetheless gives a strong sense of how philanthropy is developing and changing in each region, and which causes and communities attract the most attention. The purpose of the report is to celebrate and inspire philanthropy around the world and is the seventh publication in an initiative. Over the years, we have established a longitudinal dataset that tracks trends in major giving within established and emerging sectors of philanthropy, aiming to provide donors, philanthropic advisers, fundraisers and policy makers with a robust evidence base from which to engage in debates over the social value of philanthropy and the means by which this might be promoted and enhanced. Previous editions can be found online. Coutts is a private bank and wealth manager with three centuries of experience servicing the needs of its clients. Philanthropy is in our DNA: Angela Burdett-Coutts, granddaughter of Thomas Coutts, was one of the most progressive nineteenth-century philanthropists. To this day, many of our clients are creators of change through their own philanthropy. We understand that wealth means more than money. The Coutts Institute focuses on the governance of wealth - helping family businesses succeed, helping families pass on their wealth successfully and, through our award-winning philanthropy activities, helping our clients and their families make a real difference to the causes and communities they care about.